Arfak is a mountain range that is located in the south of Manokwari city. Most of its region is still covered by tropical rainforest. A lot of species of plants and animals live in the mountains. Some of them include Lesser Birds of Paradise (Paradisaea minor), Cuscus Possum, Papuan Frogmouth, various kinds of big trees and lianas, glowing mushrooms. 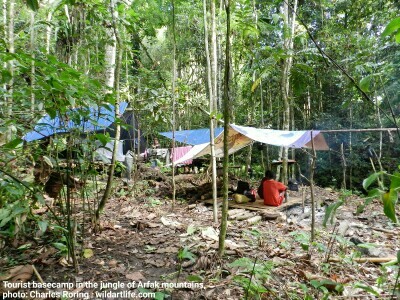 Hiking Camping and Wildlife Watching The best way to watch wild animals in the jungle of Mount Susnguakti of Arfak Mountains is by staying there for several nights. As a tourist guide, I provide tents, cooking and eating utensils that visitors can use during the rainforest tour. The tents are located near a small stream. To watch Lesser Birds of Paradise (Paradisaea minor), visitors need to wake up early in the morning at 05.00. After drinking some tea or coffee and eating bread or biscuits, they need to start hiking to the birding site located approximately 30 minutes away from the basecamp. Birds of Paradise and other birds are usually active from 5.30 to 09.00. The birding trip can be continued to higher elevation area to watch King Bird of Paradise (Cicinnurus regius). The male bird has got red color on its back and wings and white color on its belly. During the day, visitors can go hiking in the forest to see unique plants, jungle lizards, and butterflies. In rainy season, a lot of species of mushrooms grow on the ground and during dry season certain trees can be seen covered by their flowers. The exploration of the forest can be done at night to see cuscus possum, glowing mushroom, fireflies. Sometimes, the sounds of Papuan Frogmouth bird can be heard in trees. Fly from your country to Jakarta, the capital of Indonesia. Fly from Jakarta to Manokwari city by using such domestic airlines as Sriwijaya Air, Garuda or Xpress and Batik Air. I will meet you at the airport and arrange your trip and guide you to Arfak mountains.